Biodiversity is essential to the healthy functioning of ecosystems around the world and helps mitigate climate change. You can join us in taking action on this issue here. Unspoiled wilderness is an increasingly rare phenomenon as humans open up more and more landscape to industrial activity and settlement, according to a new study published in the scientific journal Nature. 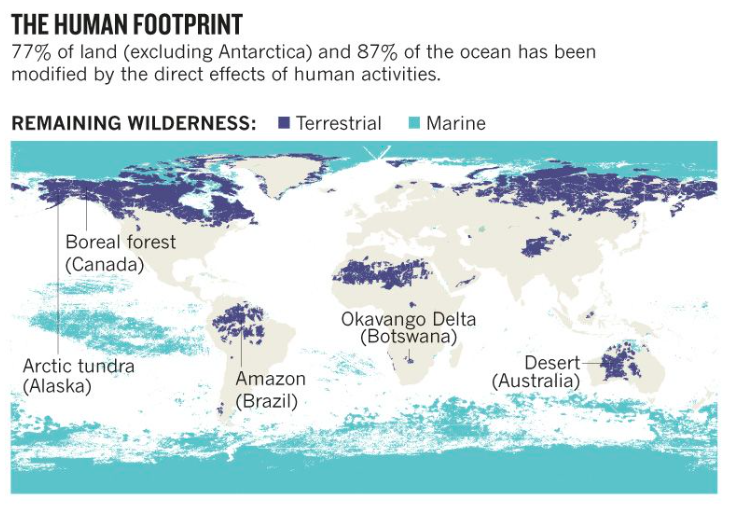 The report found that 70% of the world’s remaining untouched wilderness exists in just five countries, and these areas are preserved largely because they’re far from human civilization, suggesting that countries just haven’t gotten to them yet. As a sign of that, 77% of the world’s land and 87% of the world’s oceans have so far been modified by humans. “This must change if we are to prevent Earth’s intact ecosystems from disappearing completely,” he wrote. The researchers behind the report, from the University of Queensland (UQ) and the Wildlife Conservation Society (WCS), created a map to show where these landscapes and marine environments exist. The largest remaining tracts of pristine wilderness are the vast forests and plains of Northern Canada, Alaska, and Russia. In recent years, industrial interests have made inroads in these regions to extract fossil fuels and harvest wood. Russia also holds most of the world’s remaining untouched marine environments. Brazil is another member of this group because of the Amazon rainforest, the largest tropical forest in the world. Notwithstanding a brief period of environmental regulation that protected the forest in the mid to late 2000s and early 2010s, the Amazon has faced relentless destruction over the past several decades, and has shrunken by 20%. The country’s new president Jair Bolsonaro is expected to be greenlight logging, mining, and more throughout the Amazon. The final country holding the bulk of the world’s wilderness is Australia, which is home to vast deserts. Zooming out, 94% of the world’s remaining wilderness exists in just 20 countries. The research highlights the need for these countries to adopt strong environmental measures to protect these landscapes to maintain ecological balance and integrity. It also emphasizes an inequality of natural resources around the world, a matter which will become of increasing concern as water resources become strained in the decades ahead. By 2050, more than 5 billion people are expected to be affected by water shortages. Untouched wilderness is crucial to generating, cleaning, and distributing water around the world, and could help to mitigate the looming water crisis. These landscapes also clean the air and act as carbon sinks, regulate the global environment, buffer countries from natural disasters, and they’re critical refuges for countless species. The precedent for conservation, however, is not especially promising, according to the authors. Globally, the world has lost 1.2 million square miles to human activity between 1993 and 2009, which is around 20 times the size of Germany.